The is a contact-closure input detection circuit that automatically forwards sensor data to a network address that you specify. Configure WiFi Push Notification controllers for your choice of UDP or TCP communications. 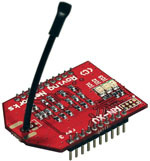 WiFi Push Notification controllers send small packets of data to the IP address of your choice. Push Notification controllers do not directly generate Emails or SMS text messages. Optional N-Button software or custom-developed server software is required for this functionality. The Push Notification Quick Start Guide will help you setup your Push Notification Controller for your particular application.